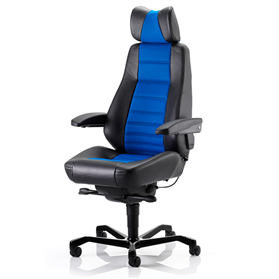 The Controller chair from KAB Seating has proved its worth over the years as offering an extremely durable work chair at a reasonable price. It resembles a truck KAB chair as this is how it has been designed from. The arms are adjustable, it has a pump up lumbar support and a recline mechanism that enables the user to set the chair as comfortable as possible for those long 24/7 situations. 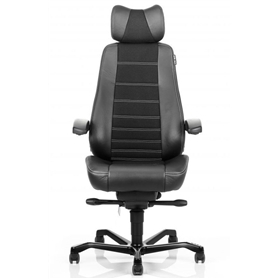 Can also be used in a dealing room, control centre or prestige office seating situation. Finished in Camira 24/7 Fabric with Black leather sides. SEE IMAGE OF SWATCH ON LEFT FOR COLOUR.